Home » Uncategorized » Union recognition at ProVote! 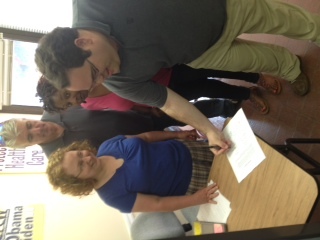 Matthew Patterson, executive director of Missouri Progressive Vote Coalition (ProVote), signs a recognition agreement today with the United Media Guild. Witnessing are the Reverend Teresa Danieley, rector of St. John’s Episcopal Church, UMG Administrative Officer Shannon Duffy and Ashli Bolden, community organizer (and UMG Unit Chair) from Missouri Jobs with Justice. ProVote has offices in St. Louis and Springfield, MO and expects to open a third office, in Kansas City, in the near future.